Calculating the Florida Medicaid Transfer Penalty | DeLoach, Hofstra & Cavonis, P.A. In order to receive nursing home or assisted living Medicaid benefits in Florida, the applicant must not have given away (i.e., made "uncompensated transfers") assets within five years of applying for Medicaid benefits. This is generally known as the Medicaid “look-back” period. The rule makes complete sense as Medicaid is a “needs-based” program that only assists those who fit into very strict income and asset levels. The rules would not want you to be able to transfer the assets away in order to get below the applicable limits. Medicaid income and asset qualification levels are listed on our Medicaid planning page. Mom makes an uncompensated transfer of $100,000 on January 1, 2016 so that she leaves an inheritance to her children. Mom has a stroke 20 months later. On July 1, 2018, Mom is now in a nursing home and her Medicare rehabilitation days have run out. She then applies for Medicaid as she is out of money, having given most of it away some 20 months earlier. Her countable assets now do not exceed $2,000 and her income is below the income cap. Because of the gift of $100,000 in the lookback period, a transfer penalty is calculated as follows: $100,000/$9,171 = 10.9 months (i.e., the amount of the gift divided by the penalty divisor = the penalty period). Thus, because of the 2016 transfer, mom will not be eligible for Medicaid benefits some 10.9 months from July 1, 2018, the day she was otherwise eligible for Medicaid and has applied for Medicaid in the nursing home. In this example, if the children simply give the money back to mom, the transfer penalty will go away. Mom will now have $100,000 and will now be ineligible for Medicaid because she is now over the asset cap. Of course, with a good elder law attorney, the family may be able to legally protect her assets even though she is already in the nursing home. Here are some quick questions on protecting assets if the elder is already in the nursing home. The transfer penalty period only starts to run at the time of the applicant is eligible for, and has applied for, Medicaid. An important aspect to gifting is that there is no de minimis exception for small gifts. Christmas and birthday gifts to family are considered transfers for Medicaid purposes and they should be disclosed on a Medicaid application. The first gifting rule is that uncompensated transfers are presumed to have been done for Medicaid/asset protection purposes. This is a rebuttable presumption with the Department of Children and Families. Importantly, even if small gifting has been done, hiring an elder law attorney may be important as part of the Medicaid process. Further, the federal annual gift tax exclusion, set at $15,000 in 2018, does not apply to Medicaid planning. The annual gift tax exclusion is the amount of money you are allowed to transfer away without either paying gift taxes or filing a gift tax return. Only if you transfer funds over the lifetime exemption (some $11.2 million per person in 2018!) will gift taxes be due. But the federal gift tax exclusion has nothing to do with Medicaid transfer penalties - you are not allowed to transfer away $15,000 per year to beneficiaries without creating a Medicaid transfer penalty. True Story: A family came in to see me regarding their elderly father who just had a stroke and was in the nursing home. He was not going to be able to go home and would need to stay in the nursing home due to poor health. For the past 5 years, the family had gifted the applicable gift exclusion ($12,000 per year at the time, $15,000 per year now) to each child based upon bad advice from the family CPA. It was not a pleasant situation to inform the children that they had to give the money back in order to negate the transfer penalty. Luckily for the family, they hired our office and with some creative legal advocacy, we helped negate the transfer penalty while getting their father on Medicaid and protecting his remaining assets. Another important aspect is that not all gifting will be counted as an " uncompensated transfer" for Medicaid purposes, but any gift must be disclosed to the Department of Children and Families (DCF) at the time of the Medicaid application. If a transfer was made, you should consult with an elder law attorney. There are also a number of exemptions and exceptions to the rule that you should consider as well. One such exemption is that uncompensated transfers, i.e., gifting, does not count between a married couple. This allows for Medicaid/asset protection planning opportunities for married couples, even if one spouse is already in the nursing home. Are there legal ways to protect assets during the "look back" period? Mom has a home and $50,000 in the bank. If the family is worried about protecting the $50,000 from the high cost of nursing home care, an elder law attorney will be able to present some great options on asset protection, even if mom is already in the nursing home. This means that mom would not have needed to give her money away in order to protect it as an elder law attorney can help protect it now, even if mom is in the nursing home. The family may not want to sell the home as the home is protected for Medicaid purposes. If the family wants to be able to sell the home while mom is in the nursing home, the family could have considered an irrevocable asset protection trust just for the home. We have more information on Florida Medicaid asset protection options that discusses asset protection within the 5 year lookback. Should I give all my assets away five years before I need the nursing home? An attorney would rarely, if ever, advise giving all of your assets away - for a number of reasons. Most people do not want to give their assets away but if you had children you trust and you want to try to preserve assets for their inheritance, you may want to consider a Florida irrevocable asset protection trust. Irrevocable trusts used to protect assets are preferable to outright gifting to children for a number of reasons. You can learn more about the Medicaid Spend-Down on this webpage. Generally speaking, we see Medicaid "spend-down" as legal ways to spend money in order to qualify for Medicaid. It is likely that the Medicaid spend-down is best used when the elder's assets are already very close to the Florida's applicable long-term Medicaid limits. Only a good elder law attorney will be able to decide how to best spend assets or hire an attorney to help you actually protect assets. 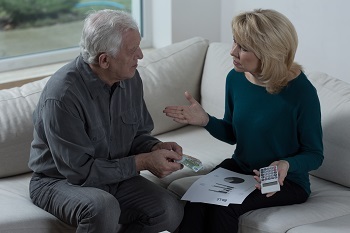 In summary, transferring money away (i.e., gifting) in order to protect the elder's funds only make sense in certain situations, such as if the elder wants to create an irrevocable asset protection trust. If you want to learn more about Medicaid and asset protection planning, please do not hesitate to contact our offices or attend one of our monthly Medicaid or Estate Planning seminars. Will the nursing home take my income if my spouse is on Medicaid in the nursing home? My elder is on Medicaid - Can we sell the family home? My elder is in the nursing home - Can we protect assets now? Protect Your Nest Egg from a Florida Nursing Home: This book focuses more on asset protection planning for people who are helping their aging loved one and for those looking to pay for their own long-term care in the future. Hi Rep DeLoach, My mom (56) is on a very low disability payments and has $15,000 from payback. I want to take a mortgage and buy her a small condo with mom's money as a downpayment. How we should proceed with $15,000?Can she gift it to me or she needs to be on a deed (but not on mortgage). The plan is she would be paying condo fees and utilities and that would leave her some extra money, for now her rent is higher than her disability payments. Christina - renting your own property to your mother could be a good way to go. Her paying you market-based rent (i.e., the normal rate you would rent another tenant) would not be a problem for Medicaid purposes. I would not want to provide specific legal advice without a consult, but your general concept seems pretty good here. If you live in the area, you could come to one of my free monthly seminars to learn more. Thank you for your interest! Hi Rep DeLoach, thank you for your confirmation. Another question that I have been contemplating... I have been thinking of purchasing a small condo and having my Mom rent it from me for a fair rent price. Are there any concerns on this idea for Medicaid eligibility in the future? I don't want a good idea to turn into a bad one since we are related and Medicaid may not like her paying me monthly rent? In reading the article, is it correct to understand that if my Mom were to gift me $5000 today and 4 years from now it is causing her a penalty with Medicaid, I could give her back the $5000 at that time if needed and she can then qualify? My Mom wants to give but I am concerned it may be an issue in the future. Frank, thank you for the question! In your situation, any issues would only be from a Texas Medicaid application and not Florida, so I cannot answer the question. Each state operates their own rules for Medicaid, and if your parents needed long-term care in Texas, then Texas Medicaid law would apply. If they were to apply in Florida, I would not see the transfer of the home to you as much of an issue. The purchase/transfer was certainly not to protect money from the nursing home, but was done for living arrangements. It was not mentioned that a large down payment on the home was made, so unless something like that happened, it should not be a concern. Hello..I have a question. I moved my parents from another state in Jan 2017. We were leasing a home and the owner decided to allow us to buy the home. Due to debt ratio problems , my parents decided to join in on the purchase. The home was purchased by my parents, myself and my wife. After six months my parents decided that florida was not for the, and decided to go back to Texas. They Quit Claimed the home to us with the lenders permission. They are no longer on the Mortgage but are still on the note. They have not made or will not make any of the payments to the lender. In the event that one of my parents needs Medicaid, will this present a problem for them? There is no equity because the loan is only 4 months old. Thanks. based upon this 8346 formula if I were gifted anywhere from 6,000-7,000 dollars I would be liable for 70-80 percent of one months NH stay at the 8346 rate. Paying Mom back lessens that liability although in the end it would be spent down by the NH to get to the 2K asset limit. Right?